I finished a few blocks for my bees - this one will be a zig zag quilt. The blocks were easy. I loved the colours. I'm not one that has much, if any, purple in my stash, but truly loved the crisp eggplant, mauve and blue colours against the white. There's also an avocado green which is such a beautiful complement. I think I may write these colours down for a future combination in a quilt. The next blocks are for my scrap busting bee. The child fabric was to be used as a focal point somewhere on the block. 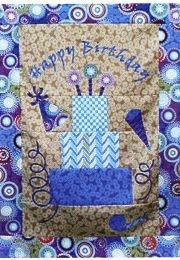 I loved this fabric, so cute! There was a ton of selection of prints to choose from, but I cannot move away from solids, I just think they frame things so nicely. Still awaiting news, but it 'should' happen this week. It was supposed to happen last week but things were interrupting the process. It's good news, a little scary, but good! Suki and I were reunited and we've been sewing smoothly...so far so good! This week, I'm going to be working on that set of linen napkins and placemats and see what I can come up with. Perhaps I'll show you my progress on Wednesday! Sewing mojo is just NOT happening this week or last ....it's the pits! I can feel it start to come back slightly though, so I hope this long weekend will afford me a few minutes of creative time to get back into it. 39th birthday year goal - to be able to run a 5km without stopping. I've never been an athlete, but I really want to be able to say that 'I can run'. Hey...anyone read the new(er) magazine The Quilt Life? There was a great article in this months June issue about the quilting journey and process. Just kinda hit home is all. My newest project for the Moda Bake Shop is up - it's called Avignon Picnic. I've got a chest cold (thanks little ones for sharing) that's kicking me right now... there's nothing girlie and graceful about a chest cough let me tell you. LOL! I won this gorgeous fabric from Australia - Umbrella Prints on the Modern Quilt Flickr Group - I guess I posted and was randomly chosen some weeks ago. Anyways...isn't this beautiful fabric? It's hand screen printed organic hemp. It would/will make beautiful projects such as handbags, totes, wristlets...whatever. It has a linen like quality... beautiful, and the colours are so fresh. Thank you so much! Confession - is it wrong to LOVE LOVE LOVE the swatch postcard they sent me the most? 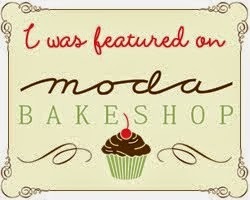 My Moda BakeShop project will be posted tomorrow! I couldn't pass these up today..
Mint condition linen placemats (thin though - not doubled fabric) and matching napkins, 6 of each. Seriously, I don't think these have ever been used or unfolded. I love the aqua border and thought these would look really cool somehow as a quilt. I'm going to do some figuring out, but I think I may need some Workshop In Progress advice soon! 6 yards of 60" white cotton with charcoal polka dots for FIFTY CENTS! It was supposed to be 12.00, but it was green tag day and all green tags were fifty cents. yay! It snowed here yesterday, blizzard like, like a good 10cm. Isn't it May? I don't think we got it as a bad as south of us, but still, snow in May?? Seriously, why do all cats seem to do this? He was in the back yard and FOUND me. See how smug he looks? My machine is at the shop. It's getting one more chance. ;-) My dealer told me not to trade it in. But I do have a new machine in mind if it doesn't cooperate after. I wonder if the seasonal change has to do with it...the garden is just starting to show some growth now, a few daffodils and tulips up, and weeds too (why are they always out first?) I feel the need to get out there! Or maybe because my machine has been so mean to me that it's transferring over? So I've been balancing and enjoying things outside of quilting too. Awhile back, I was even dreaming/nightmaring about quilting. That's bad. Taught Ethan all about twigs catching fire and then running to our pond to extinguish it and the 'pssss' sound it makes when it goes out in the water. I'm amazed at the bond that Ethan and Mandy are developing - this is a terrible night shot, but if you could see how proudly Mandy was sitting for Ethan while being brushed, it brought tears to our eyes. Ethan is in an all boy class this year (because there are only 4 girls total in all 3 grade two classes!) and his boy class was invited to sing at the music festival this year. They got dressed in white shirts and ties...and we treated him to a MonsterMudPie afterwards. Usually it's just a cone at McD's, so this was pretty awesome to him! And Cameron, well, let's just say he's in the ham it up picture phase. I can't get one serious one!